Two teen boys gunned down in East San Jose on Sunday evening were both students at Independence High School, friends and family members said today. A makeshift memorial has been set up at the shooting scene at Rhinehart Drive and Clogstone Court honoring the two victims, Christian Comilang, 15, and Johnson Cunlar, 14, who were friends since elementary school, according to Comilang's aunt. 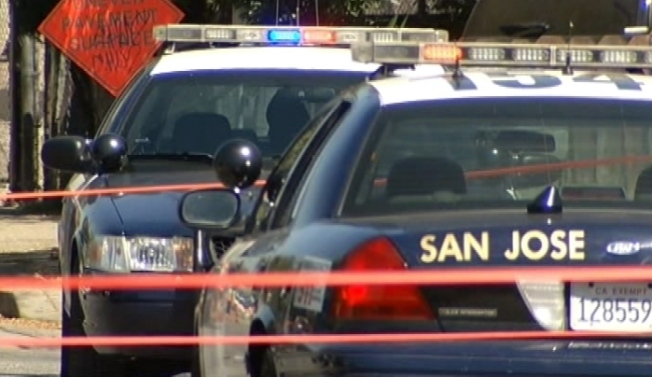 San Jose police confirmed the victims' identities late Tuesday. Comilang, a sophomore, lived in San Jose with his parents and his aunt, who moved to Arizona for a job transfer about four months ago but flew back as soon as she heard the news about her nephew's death. She said that she had last seen the two boys together at her nephew's eighth grade graduation when the two boys were eating together. "My nephew was a very, very lovable and funny kid," said the aunt, who declined to be named. She said she used to pick Comilang up at the school every day. The two boys were shot in broad daylight at about 6:30 p.m. in the mostly residential neighborhood near the back parking lot of a large supermarket. One was pronounced dead at the scene and the other was taken to a hospital but died shortly after. The memorial was set up on the edge of the parking lot, with large color photographs hung from trees, flowers, candles and notes. A boxing glove was left for Cunlar with the message, "We'll miss you." In the tradition of bringing favorite foods as a memorial, a plate of chicken and rice, bottles of Arizona iced tea, McDonald's cups, Mickey's malt liquor and bottles of Jack Daniel's were also left there. Two friends of Comilang's, Kim Jacalne and Angelica Sabinay, both 17, stopped by early this evening to hang signs at the memorial saying, "We love you Christian from Kim and Angelica" and "We love you Johnson and Christian." Jacalne and Sabinay both graduated from Independence on Wednesday, and Sabinay said she saw Comilang at the graduation but didn't have a chance to speak to him. Jacalne said she had spoken to Comilang on Saturday and comforted him because he was feeling depressed. "He was really, really nice and friendly, super sweet, he cares about people. I think he loves to play football, he loves music," Jacalne said. "I can't imagine he's gone forever." The girls said they were at a party together Sunday night when they heard about the shooting. "We still can't accept the fact that he's gone," Sabinay said.